Turns out that a commitment to vetting resources for the Reading Room means reading those resources. Also turns out that when trying to prompt discussion in an open forum for the high-functioning mentally ill, it makes sense to discuss those readings during the vetting process and maybe even vet together. I am not a literary expert, and this is not a book review. I’m a self-consciouly unread mental health patient, and I never read memoirs. This is also not any sort of synopsis. Instead, consider it a response or reaction as I go. I don’t know how else to do this than to just let the text itself prompt some discussion. If you’ve read this, please let me know what you thought. If you haven’t read it, feel free to react to the passages quoted here and/or my response. 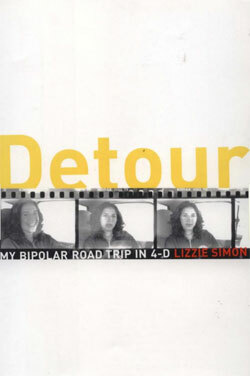 I am little more than one hundred pages into Lizzie Simon’s Detour: My Bipolar Road Trip in 4-D. I made the mistake of googling and finding her website. I’m trying not to let what is present there affect this reading. Thus far I know that Simon is bipolar. I also know that she’s in her early twenties and high-functioning when she decides to embark on an expedition to find her “herd,” those like her: the young, successful, bipolar people of the country. “Mental illness interacts with the way you define yourself from the instant it enters your life” (40). “We both wonder if there could ever be a sure diagnosis of bipolar disorder in the absence of a traumatic episode, because you can make excuses for the milder symptoms” (108). “She’s survived mental illness and experienced a new dimension to existence, a fourth dimension. And that fourth dimension doesn’t go away just because her dangerous episodes do. It makes her different, and difference is always a blessing and a curse” (64). She said “survived.” And despite what I just wrote, I don’t sit completely comfortable with that word when I read it. I wonder whether to survive one must have been near death. And regardless of how close we each come to different forms of death, I wonder whether I want to remind myself of that each time I consider who I am. I wonder if not reminding myself is denial. I wonder whether I have, in fact, survived — or whether my earlier self is gone, and through that requisite trauma I’ve been reborn. I wonder whether the self-definition as Survivor would be empowering. These are things I wonder. I share these wonderings because I think they’re generalizable to other mental illnesses. Simon’s journey focuses on bipolar disorder (a decision I’m not totally into), but her investigation applies to much of the mentally ill community. Still getting used to WordPress: I make no guarantees about these “Possibly Related Posts” that are automatically generated by WordPress. Pingback: Reading Response: Detour (2) « Define "Functioning"